One of the most striking features of the Psalter, apart from its very early date, is its exceptionally large size. This gives the impression that it was created as a consciously prestigious object for use in important liturgical ceremonies, rather than for private study or devotion. By the 12th century, however, when extensive Old English glosses and Latin commentaries were added, it seems to have been being used for a different purpose. 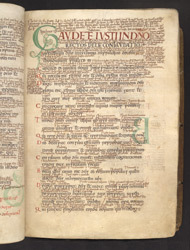 All the evidence suggests that the book was made in Canterbury, perhaps for St. Dunstan, but scholars have long argued over whether it comes from the cathedral or from St. Augustine's Abbey. The start of Psalm 32 is marked by an initial 'G' with the heads of a bird, an animal, and a man. When originally written the appearance of the page would have been very different, because all the text in smaller script and paler brown ink, in the margins and between the lines of larger, darker script, are later additions.